It’s often difficult to understand why identically-sized tubs of ice cream can vary so much in price. Cheaper tubs may seem like better value – but ice cream is sold based on weight rather than size. Heavier tubs are generally more expensive – and for good reason. Ice cream, in its most basic form, is a simple thing to produce: a combination of milk, sugar and cream create a base mixture. Once the mixture’s been chilled, the flavours are added. This initial method is the same for pretty much all ice cream manufacturers. However, the way in which ice cream and sorbet mixtures are treated during the next stage of the production process varies – and it’s this which sets us apart from other brands. Once the flavours have been added to the ice cream base, it’s simultaneously churned and frozen. Air is then added to the mixture – and the amount of air bubbles has a huge effect on the density of the ice cream. Manufacturers of cheaper ice cream tend to use free flow machines, filling their mixtures with more air. The increased volume of air reduces the amount the ice cream needed for each tub, and can therefore be sold at a lower price. 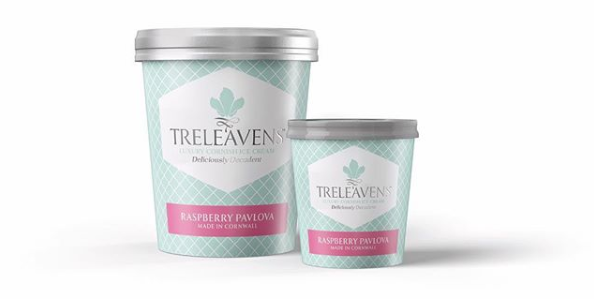 Here at Treleavens we do things differently: instead of producing vast quantities of mixture as cheaply as possible, our primary goal is to make the finest ice creams and sorbets in the West Country. Rather than using free flow machines, we create our ice cream and sorbets in batches to guarantee quality. We limit the amount of air in each batch so there’s more mixture in every tub of ice cream we make. If you don’t believe us, just pick one up – it feels much heavier than cheaper brands. So you see, weight really does matter when it comes to ice cream.